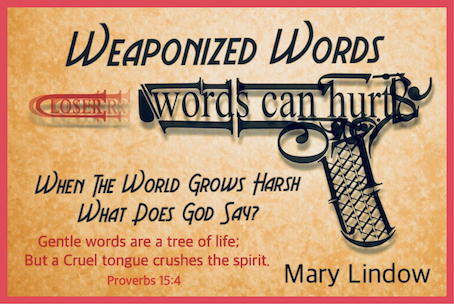 “WEAPONIZED WORDS” - When The World Grows Harsh, What Does God Say? I have been thinking a lot this week about arrogance and those “finger pointing” individuals who enjoy belittling others and simply “love” to be plain old “snarky”. Just look at the headlines of newspapers, Internet news and gossip columns! With the stroke of a key or two, words written imply things that can break hearts, ruin trust, hope, National Security and relationships. DOES A “VERBAL SLAP DOWN” OR SHAMES YOU. Usually it occurs when THEY believe that THEY are absolutely right or have "superior" knowledge, and that others are the "lesser" and are the "wrong- big- dummies". This mean and sour arrogance, which uses power to belittle or harm others, is something that crushes and cripples hearts and dreams. It’s a secret and deep seething storm inside of the soul of those who feel they have “rights” and superior thinking that justifies “weaponizing words”. Yes... weaponizing! Words can deliver pinpoint missiles of pain, threats, ridicule, humiliation, subtle undertones of condescension but can also deliver payloads of healing, warmth, gratitude, encouragement, and above all, Hope. As a believer, our faith should not be arrogant —nor should a person of faith belittle others! We should never use our faith or intelligence to pretend that we are superior or more informed than others! NO! NEVER! Belittling is a form of bullying! It’s when someone makes you feel as though you are little, minuscule, not good enough. Arrogance is the opposite of humility, and humility is supposed to be a Christian virtue. Jesus Christ who, in coming into the world and living and dying alongside of us, lived out what humility is. You will never reach the place of honor or full use by the Heavenly Father, (and can actually be disqualified from many opportunities) until your insecurities and need to needle, belittle, compete with, or shame others is addressed, repented of and buried! And, when mentioning, “reaching a place of honor”, I’m referring to this as honor before the face and rule of God. …You will be one who certainly tramples others with your words. Those who have the sickness of pride in their hearts, speak of others’ weakness and sins with contempt, irritation, frustration, or judgment. Pride is crouching inside of your meanness and belittling of the struggles of others. It’s cowering in your jokes about the 'craziness’ of your spouse, the mocking of that, ‘too sensitive friend’. It may even be lurking in the prayers we throw upward for our friends that are — subtly or not — often tinted with the color of exasperated irritation. Listen to Proverbs 15:4 from The Message translation. Cutting words wound and maim." Sometimes, we use sarcasm to voice harsh, or cutting words we otherwise would not say, often intentionally hurting others. Once the pain is inflicted however, we retreat, saying, "Oh, I was just kidding”. But the sting of those words hurts so much that those we have injured, withdraw. Our words don't feel like jokes at all. for every careless word they have spoken" (Matthew 12:36). TO THE PERSON WHO MAKES THEM. THAT SCAR TO THE VERY CORE OF THE HEART. Many times, sarcasm shames a person, causing them to feel belittled and unworthy. When shame takes root in the heart, it can cause disastrous behavior, because the person now feels worthless and seeks desperately to find anything that will make them feel otherwise. Shaming others is a serious offense with serious consequences. and your words will declare you either innocent or guilty." Are your words kind and constructive? Do they desire to seek peace and unity, or are they driven by your fleshy desire to sting, aggravate, retaliate, tease, belittle, control, alienate, shame and manipulate through sarcasm? YES ... alllll of those HURT PEOPLE! The enemy is camping out at the gate of your every relationship. Children, spouse, boyfriend, girlfriend, parents, co-laborers and more. He is lurking around every corner, seeking to find that one open crevice where he can enter. If he has been entering in and camping out in your home or relationships through the use of sarcasm, it’s time to boot this verbal enemy out and lock the gate behind him. Die to your need to be snarky and always the one with a chirpy sarcastic comeback! Allow Christ to show you His ways that love, peace and compassion can be the source of every word that proceeds from your mouth. I confess now to You, that I do not always love my neighbor. I confess that I have despised others, even to the point of hatred. I confess that I have been hurt by others. I confess that forgiveness and reconciliation at times are just impossible for us. Father I ask you to heal them from the things that I have said that caused broken and crushed spirits. Restore them; bring them Friends that will treat them kindly. I know that nothing is impossible in You. So, I come to You, seeking healing and wholeness for myself. Heal whatever is inside of me that needs to speak poorly of others, or to speak down to others. Show me the parts of me that are insecure or needy. Help me, whenever possible, to live in peace with others, to seek reconciliation and healing and forgiveness. For Your Son Jesus came and lived among us, and was betrayed and denied, abused and put to death. Yet, He rose again, and came with the message of peace to those who had denied Him and abandoned Him. Oh Father! May I walk in His ways and model His kindness in my speech and actions. I pray this in Jesus’ loving name. Thank You Copyright © 2019 " THE MESSENGER "